Preorder On Amazon and Receive A Discount. Because religion affects almost every aspect of our lives, our religious beliefs deserve careful consideration. Yet it is obvious that our beliefs are heavily influenced by our different cultures and environments, so much so that there is often little room left for unbiased reflection. Most people in the Middle East are Muslim; in India, Hindu, and in the Americas, Christian. If you had grown up in Pakistan, you would probably have become a Muslim, just as you would probably have become Christian had you been born in Alabama. If so, where is the free will in that? Does the happenstance of your birthplace so determine your outlook that you become like your neighbors? Some of our beliefs were passed down from generation to generation without proper consideration of the available alternatives. Advances in communication technology are now giving us access to different cultural traditions, as well as to the latest scientific discoveries, and are challenging paradigms that were at one time exempt from scrutiny. At the same time, the amount and variety of new information that we are now receiving can be overwhelming. Paradoxically, this often seems to make traditional beliefs more appealing, since they offer shelter from the difficulties of deliberately choosing among less well known alternatives. 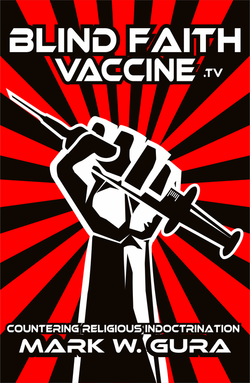 The Blind Faith Virus Vaccine offers a solution to this paradox by classifying all religions and systems of thought into three simple possibilities, making it easier to choose a direction in life. It shows new connections between Secular Buddhism and Atheism, paganism, the Abrahamic religions and Hinduism, and it helps challenge, demystify and falsify faith-based ideas that are accepted mostly because of religious faith. "Faith, by virtue, is a concept that goes unquestioned. 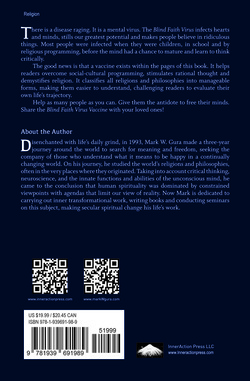 Gura's book will assist you in making informed decisions about your beliefs." - JD Stockman, Apistevist-Antitheist-Humanist.